The Sixers looked pretty darn good Wednesday night against the Knicks. If you're going to be an NBA title contender, you have to beat the crap out of crappy teams. The Sixers did just that Wednesday night, playing perhaps their best all-around game of the year thumping the lowly Knicks 117-91 at the Wells Fargo Center. What they're saying: Markelle Fultz is probably done in Philly, but what could Sixers get back in a trade? What's behind early defensive issues for Sixers this season? • J.J. Redick was the star early, scoring nine of the Sixers' first 18. Back after his first rest mid-quarter, Redick added five more points, going a perfect 6-for-6 in the opening frame (Philadelphia scored 41 first quarter points by the way, besting their NBA-leading average by more than 11 points). Redick scored 24 points including four threes in the game but also proved to be a potent threat under the basket, driving to create offense around the rim. To what do we credit his particularly proficient play against New York? Obviously it's the haircut. 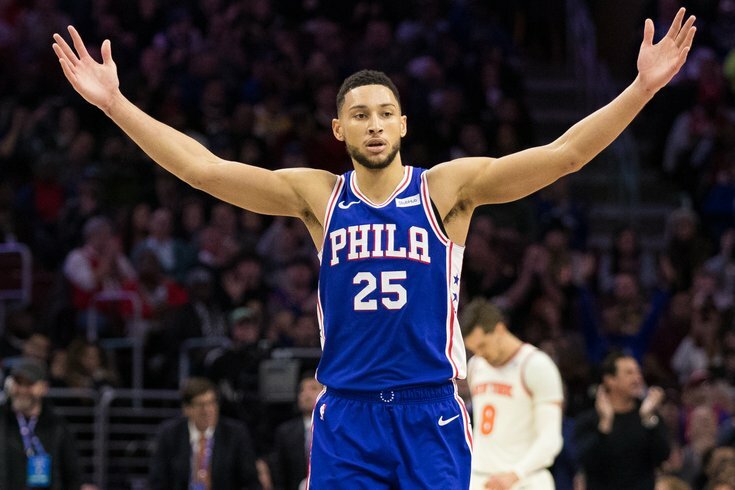 Speaking of Simmons, in his second real season a sluggish start (by his standards at least) looked to be in the rearview as he turned in one of his typically inspiring, well-rounded performances reminiscent of his Rookie of the Year campaign. Limited by the blow out win, Simmons had 14 points, eight boards and seven assists in 24 minutes. • What are the downsides to playing T.J. McConnell? Honestly? He has limitations, sure. But when he's on the floor it's hard not to watch and admire his effort and passion on the floor. Sadly, the team looks as if it hasn't really missed a beat with Markelle Fultz sidelined. Two early drives to the hoop and some solid defense started off his quiet but effective night, as he netted six points and six rebounds in 25 minutes. It's also worth noting with that with 6:21 to play in the second quarter Embiid was half way to a triple double, with 13 points, six rebounds and five assists. He would finish with 14 rebounds and yet another double double in only 30 minutes of playing time. • "Now entering the game, No. 11, Demetrius Jackson," means something went either really really well or really really wrong. • The Sixers shot 54 percent from the field. The Knicks shot 34.8. That'll do it. • Depending on how you look at things, the fact that back up center Amir Johnson didn't enter Wednesday's game until the 8:26 mark in the fourth quarter, and played just those eight minutes could be a good thing. Brett Brown seemed pretty happy using Mike Muscala in the back up big role and relying on the Sixers guards and wings to fill up the rest of the team on the floor. The veteran only played in a mop up role late in the contest. • Jimmy Butler didn't have a bad game, per say, but his production — in contrast to the big numbers from the Sixers' other stars — left some to be desired. The newest Sixer didn't score his second bucket until the five-minute mark in the third quarter and shot 3-for-7 from the field for seven points. While he did create for his teammates, he seemed to take a backseat offensively during his 25 minutes on the hardwood. • The Philadelphia defense has been sliding, allowing over 114 points per game one of the five worst rates in basketball. Allowing only 91 points to New York was a nice change. • I got nothing. Kyle?